The layout of your CV is as important as its content purely because it says plenty about who you are both as a person and as a professional. A messy CV that doesn’t flow and isn’t consistent in terms of font and spacing says that you are probably a lazy person with poor attention to detail. A long-winded CV might cause you to come across as arrogant, whereas a CV that is too short will make it seem as though you are underqualified. The key lies in finding a balance and ensuring a logical progression of information. 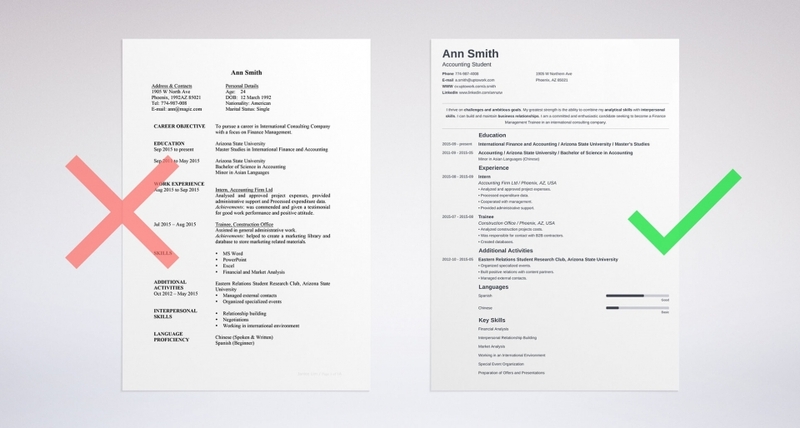 Ultimately, the way in which you lay out your résumé will largely depend on your industry. For example, in the media and advertising industry, colourful and creative CVs are always welcome. However, in the banking or finance industry, a clear, concise and standardised version is best. While the overall design of your CV may differ from industry to industry, the order in which you present your potential future employer with important information about yourself remains the same. It is essential that you include such details as your full name, contact number(s) and email address. A cover letter should be addressed directly to the person who posted the job ad. If the name of this person is unknown, simply address it to ‘to whom it may concern’. Personalise this letter by writing about why you believe you should be considered for the particular vacancy, briefly highlighting your strengths/skills/work experience according to the requirements mentioned in the ad. List your education information in reverse chronological order to ensure that the qualifications which are most important are the first ones that your potential future employer sees. Again, list your work experience in reverse chronological order and be sure to include some details regarding your responsibilities at each company. Avoid clichés and include skills most relevant to the position first. Two references should suffice. Be sure to include the full names, phone numbers and email addresses of both references. Your CV is the first thing that the employer or recruiter see. So it is your first impression before your first impression. So learn to master the art of creating a standout CV so that your looks more convincing than the rest. There is no way recruiters are going to read all the CVs in detail. They begin by ‘scanning’ the CVs received by reading them diagonally. Only those that catch their attention upon first reading will be examined more closely. Choose an attractive layout by structuring your ideas. For this purpose, use paragraphs and clear titles. A CV is a professional document. Don’t try to make it stand out by using an eccentric font or colours. Keep it simple, clear and to the point. Your CV isn’t a novel. Avoid telling the story of your life. Make sure the document doesn’t exceed 1 to 2 pages of A4. Indicate a few relevant elements regarding your professional experience (tasks, responsibilities, etc.) and possibly your education (courses, title of your dissertation, etc.). If the recruiter wants to contact you, they must be able to find your personal information at first glance. Put it at the top of the first page. Think of putting your age rather than your date of birth to make things easier for the person reading your CV. Avoid putting ‘curriculum vitae’ at the top of the document. Similarly, don’t put ‘name’ in front of your name, ‘address’ in front of your address, etc. If your CV is clear and well structured, there will be no room for uncertainty. Your experience is what interests the recruiter above all. It is more important than your training and must therefore be mentioned first. Make sure it is relevant to the job for which you are applying. No professional experience yet? Then emphasise any placements and student jobs. If you really don’t have any relevant experience, begin with your education. Of course you have to mention your basic education and your specialisations relevant to the job, but make it brief. If you have a degree, the recruiter won’t be interested in your primary and secondary school studies, for instance. Have you done any training during your career that you think is pertinent to the job in question? Speak about it briefly. Whether you are writing about your experience or your education, the most recent information is the most important. Always put it first. Don’t forget to mention your language and computer skills. It is essential but also mention your level of knowledge. For example: excellent, good, average, basic. Regarding languages, make a distinction between your reading, spoken and written abilities. Your CV isn’t a standard document. It is in your best interest to adapt it according to the job you are targeting. Some experience or education/training might be more relevant for one job than for another.